This week, our Head of Partnerships, Andy Ling, told us all about his recent visit to Brands Hatch and describes driving a classic mustang around this infamous track! He also speaks about plans for a very special event we’ll be holding there this summer! We hear that you recently visited Brands Hatch. It’s one of the most famous racing circuits in the country. Can you describe it for us? It’s hard not to be impressed with Brands Hatch, venues don’t come much slicker in terms of quality and facilities, let alone the amazing heritage the circuit can claim. Around a dozen Grand Prix’s ran here up until the early 1980’s. The Brands Hatch wow factor is a key reason why this August we’ve pushed the boat out and will be running our very own exclusive, fantastic supercar driving event called SummerSpeed. A huge amount of planning has gone into it, so as well as enjoying the Mustangs and catching up with one of our great experience partners (thanks Ant and your excellent team! ), I wanted to tie up a few loose ends to ensure SummerSpeed will run like clockwork. How was your classic mustang experience? Great but, like a typical bloke, I thought I’d be able to handle the Mustang at top speed with no problem. How wrong I was. Like many heavy American cars they don’t do controlled cornering unless at a snail’s pace. Additionally the six litre V8 supercharged engine makes it frighteningly easy to wheel spin if you’re heavy on the accelerator. I was never going to get driver of the day but it was a lot of fun and I managed not to spin off (unlike some others). Was that the end of your excitement? Not at all – a few extra surprises made the day even more special. 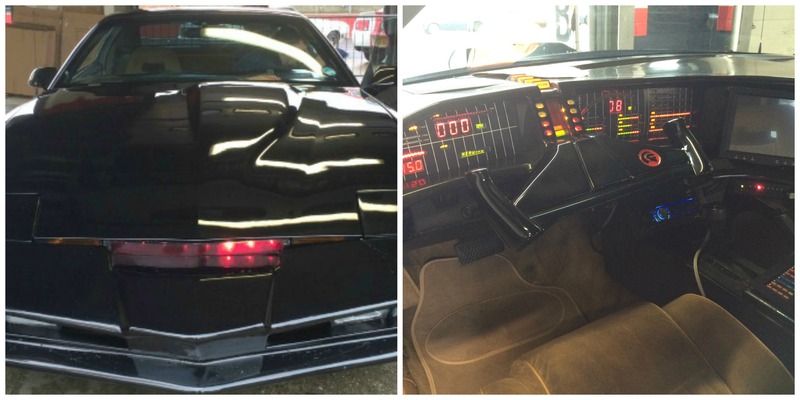 First, a special appearance from Knight Rider’s KITT – a 100% sleek replica with lights, sound effects, talking dashboard and all – for those of us who fondly remember the 1980’s TV series with David Hasselhoff. A team from the National Geographic Channel were on-site too, filming Car SOS, hosted by Tim Shaw of Channel 5’s Fifth Gear (Top Gear’s rival show). The show features car-obsessed presenters restoring beloved old motors, then presenting them to very surprised owners. A customer thought he was at Brands Hatch just to enjoy his Mustang driving experience, but when he pulled into the pits, a camera crew pounced on him and rolled out a stunning Corvette. A month previously it had been lying unloved and rusting in storage. The look on his face was priceless, there were even a few tears. I was pulled in as an extra, so look out for me when the show airs in a few months! Sounds like a full day! What was your favourite part? It may come as a surprise but I‘ve not been on many driving experiences recently (hint, hint Jon – my Driving Partnership Manager) so to do a full experience relatively new to the UK was great. That, combined with seeing my 1980’s hero KITT, witnessing someone receiving a present they could never have dreamed of and then sorting a few finishing touches to the planning for SummerSpeed all made for a dream day.